Last year, I introduced y’all to my friends over at Sunnyland Farms in South Georgia when I shared my Easy Caramel Pecan Cheesecake. Sunnyland is an amazing pecan farm owned by the sweetest family you’ll ever have the chance to meet. They offer a huge variety of pecans, pecans pieces, and pecan meal (among a host of other nuts). And then there’s the amazing list of cakes and candies they make. From Rum Crunch Cakes to traditional fruit cakes to pralines to brittles, bark, and chocolate covered every-things… they’ve got it all covered. Sunnyland is a great place to get gifts for all the folks on your holiday list. 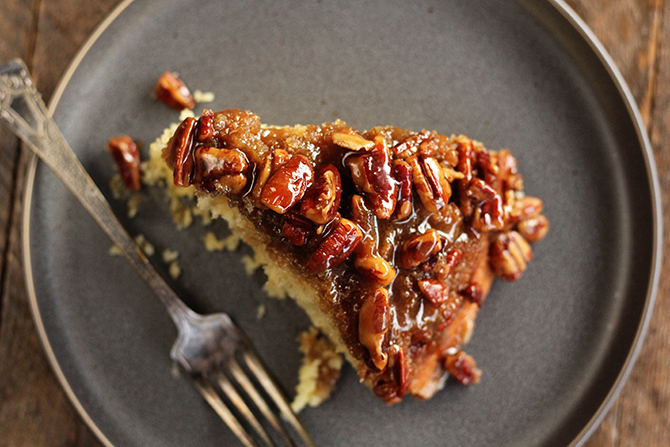 Let’s get to this gooey deliciousness known as my Caramel Pecan Upside-Down Cake. So, my friends sent me a variety of pecans to get in the kitchen and create with. This cake was the result. Y’all. Just give me a minute here… This thing is absolutely amazing. It is decadent enough to make it ideal for any holiday but it’s also the perfect way to add something special to a random Thursday being it’s so easy to make! It’s perfect on both occasions. Seriously. I’ve shared my Pineapple Upside-Down Cake and my Caramel Apple Upside-Down Cake with y’all before but, honestly, I think this is my favorite. And that’s saying a lot because I LOVE that pineapple version. 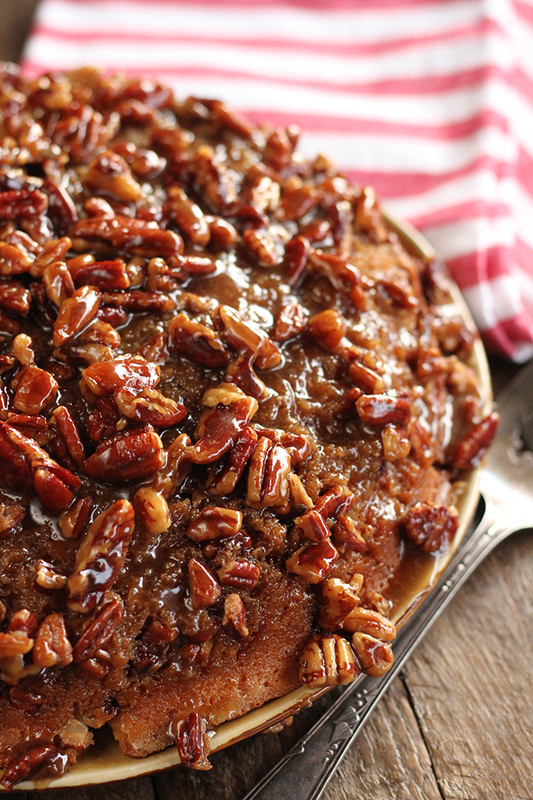 The pecans get toasted to perfection and drip in the decadent caramel sauce. It’s all perched on a tender, flavorful yellow cake – that no one will ever suspect started with a box mix. It’s about as close to perfection as I could imagine. Pecans can be a luxury. For the recipe I call for chopped pecans. I used these Large Pecan Pieces from Sunnyland. They’re more affordable, make the cake easier to cut, and they look beautiful. There’s no reason to buy full halves and then chop them up. Save a little money. Every little bit counts, right? Make sure to use a well seasoned cast iron skillet to keep the cake from sticking. Sometimes I’ll even wipe the inside of the skillet with a little oil and a paper towel as a little insurance policy – just to be safe. No cast-iron skillet? 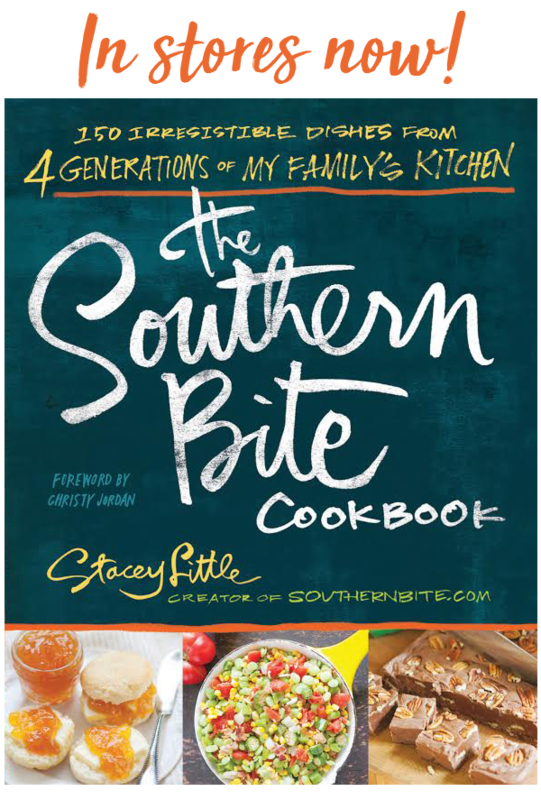 A 10-inch, super deep dish pie plate or even a 2-quart casserole dish will work. 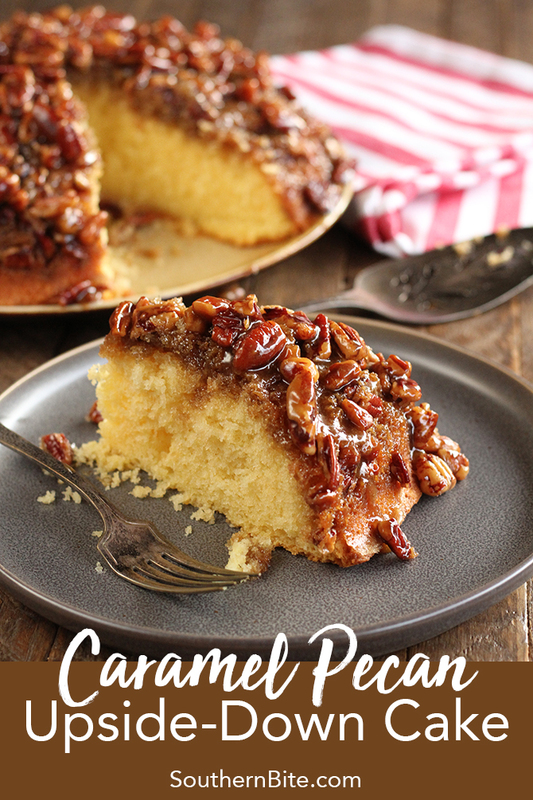 Simply cook the caramel and pecan mixture in another skillet on the stovetop and then pour the mixture into a greased dish and then add the cake batter over. Just make sure to pick something appropriately sized to hold all of the batter and bake without overflowing. Y’all are gonna LOVE this one! I just know it! Enjoy!! Preheat the oven to 325°F. Heat a well-seasoned 10.25-inch cast iron skillet over medium-low heat. Add 1/2 cup of the butter, brown sugar, corn syrup, salt, and pecans. Cook, stirring frequently, until the butter has melted and the sugar has dissolved. Remove from the heat and set aside. Allow the cake to cool for about 10 minutes then place and large plate or platter over the skillet and carefully flip it over to turn the cake out onto the plate. (A dish towel works great to assist in this as the pan may still be hot.) 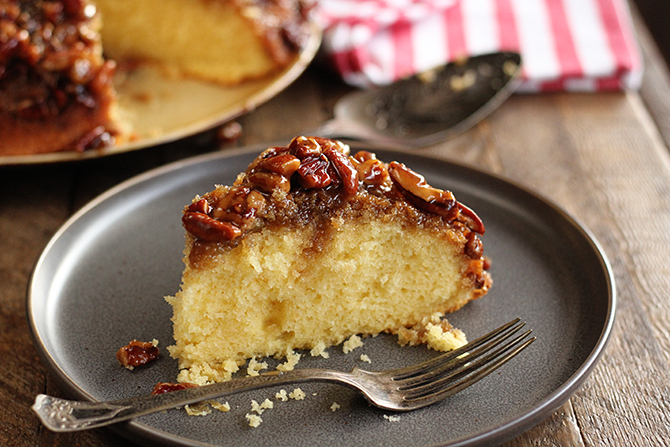 Scoop any pecans and sauce remaining in the skillet over the cake. Serve warm. This post is sponsored by my friends at Sunnyland Farms, but the thoughts and opinions expressed here are all mine… just as always! This looks ahhhhhhmazing! I can’t wait to make it! I hope you’ll love it as much as we did! Do you think I could make this in 9×13 cake pan ? Are would I need to double the recipe ? I’m thinking about taking it to church potluck. A 2-quart baking dish would be a better size, if you have one. 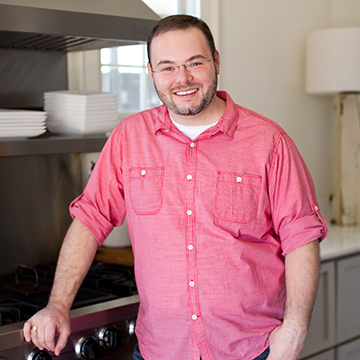 You can certainly do it in an 9×13, but will need to adjust the cook time accordingly. 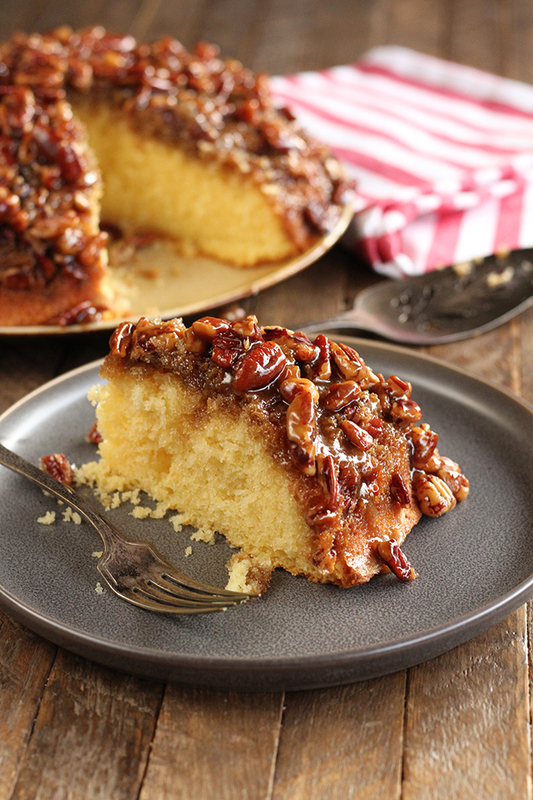 Without doubling it, you will end up with a thinner layer of cake and less pecans and caramel. I don’t have a cast iron skillet. Can I make this in a regular baking pan? A 10-inch, super deep dish pie plate or even a 2-quart casserole dish will work. 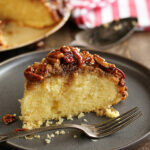 Simply cook the caramel and pecan mixture in another skillet on the stovetop and then pour the mixture into a greased dish and then add the cake batter over. Just make sure to pick something appropriately sized to hold all of the batter and bake without overflowing. OMG Stacey!! This looks so good!!!! Definitely making this SOON!!! Thanks! Hope you’ll enjoy it! The picture looks good enough to eat so I bet the real thing is absolutely delicious! My husband is always on a diet lately, so I guess I’m going to have to invite friends in to share it with so I don’t eat the whole darn cake! It’s great to share with friends! Enjoy!! Have a luncheon on the 16th this month and have been wonder what to take. You just solved my problem. Thanks! This looks so good and I have the pecans on my counter. As it’s just me I don’t dare make one ahead of time as I don’t need the extra 5 pounds. Merry Christmas. Ha! I sure hope everyone will enjoy!! Merry Christmas!! Would it still work (even though it would be thinner) using a 12” cast iron skillet? Yep, just monitor the cook time. It’ll probably cook faster. It was amazing. So easy. I took it to a family reunion and it was a hit. Love hearing that! So glad they enjoyed it!! This was delish & so easy & quick to make. I used a 10” non-stick Cuisinart Everyday Pan & it came out well. Served w vanilla ice cream. Did state on directions to serve right away. That makes sense — the caramel gets hard after the first day & is hard to cut. But will make again. Stacey, the cake looks yummy, unfortunately, I can no longer eat nuts, per the doctor’s orders. 🙁 BTW, I no longer see your recipe search drop down box feature. That is what I would use to peruse your site for different recipes. I wanted to find your Cabbage Soup recipe and had to go onto my search engine to find it. Hi Jane! Thanks! Just make sure the window you’re viewing the site in is maximized. Sometimes with smaller windows, the search bar gets cut off and disappears. since i am diabetic,i will be substituting honey for the corn syrup and cutting back on the brown sugar. You’re welcome to do that, but you might find the caramel sauce to have a very different texture and thickness. I think it should be fine. The caramel can just get a little hard it it sits too long. A quick zap in the microwave should help that.